I made this for the first time, so i didn't really do a good job folding the pie, but no doubt about the taste... Yummy!!. Since my hubby doesn't eat fried food, i bake his pie on the oven, but the appearance is not as good as the fried one. I got this pie recipe on the Internet but i make up the filling with my taste bud. Heat oil in a large pan, saute garlic until fragrant, add beef, cook until well browned, add potatoes and carrot. Add the glass noddle,season with salt pepper and beef stock powder. Place the combined flours, salt and margarine in the bowl of a food processor and process until it resembles fine breadcrumbs. Add egg and water and process until the dough just starts to come together. Roll out the pastry on a lightly floured surface, roll out two-thirds of the dough, Using a plate as a guide, cut 14cm rounds from each dough. Fold pastry over filling to enclose. Using a finger, press edge to seal. 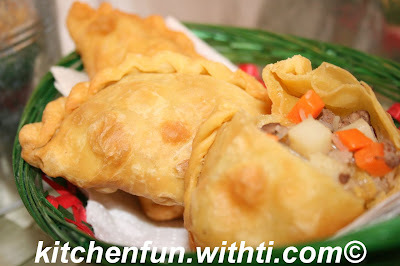 Heat a large frying pan, fried the pie until golden brown. 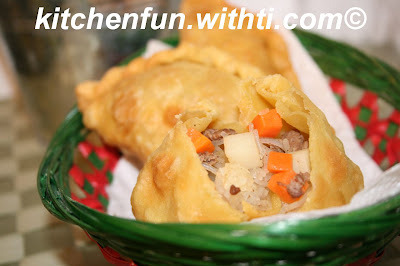 Serve with small chili or chili sauce. ZITA: boleh, boleh Jeng, hehe. ELSYE: Iya nih lg kangen sama pastel. RITA : Emang rada sudah Mba, aku milin 10 biji yang sukses cuma 2, haha. LIDIA: Hi Mba Lid, kmana aja dikau? nanti kalo dapur-mu udah ngebul lagi, coba aja bikin.